Magi: The World of Magic » The East » Kou Empire » Imperial Palace » Taking a walk. "T-that over there. That is the palace"
"The palace! "Jahanghir exclaimed as he turned to behold the building. Its architecture held no flaws, and the building held such majesty in its high ceilings. The Palace, the Castle was several stories high, vibrant and powerful color. In any direction plant life ornamented the Castle Bed and the life of the soldiers which readied themselves in lines while changing their positions. 'Amazing! I have always wanted one"
"HA! Me Too! but damned if anyone but the Emperor take claim to that throne" the old merchant scoffed and tattered along. Jahanghir left the man on the street. How could he ever understand? Most people just dont seem to get it. How every man was born with the right to be king.So maybe that might be the reason why, so seldom did men become kings. "I am an Emperor" Jahanghir muttered. He had gotten chills thinking about it, the view of the Palace was something Jahanghir could only dream of. He had longed for his courtyard and rows of Jacarandas and lillies. He would one day have something large, magnificent and rare. He wondered what the mans view had been like, every day, every season every year. Jahan sped across a corner and fed magoi into his Aurangzeb! Activating "cloak of concealment". Jahanghir evaporated into thin air, and his sound and smell had become cloaked. Jahanghir headed back towards the Imperial palace. He ran to the front of the building and looked for an opening to enter as the soldiers began changing their shifts. He would be careful and slip pass the rows of soldiers ushering to their stations, stopping when he needed too. When he entered into the palace he would quickly get out of the way and take in everything. He was curious about it all, what kinds of things could be hiding away in this building? He had would explore the entire thing if he could, and so where to begin? Cloak of Concealment - When fed magoi, the cloth will shimmer for a brief moment before cloaking the user and their objects in an aura of perfect invisibility where no smell or sound escapes the person(s) being coated. The effects of this cloth can be granted to a total of four other people or creatures upon touch of the user so long as they maintain being within 1 meter of the user during the duration of the sustain. 10 magoi to activate | 5 magoi to sustain. Appearance: a golden,black and red gauntlet that extends up Jahangir entire left arm. The gauntlet is made with several sharp plates around the joints. Carved with careful detail and artistry the gauntlet has several ornate designs. The inner chamber is a a glove made of iridescent snake skin and diamond. The the hand of the gauntlet is polished a blood-like crimson and obsidian.The Gauntlet is 113 cm in length, and clawed to the tips. 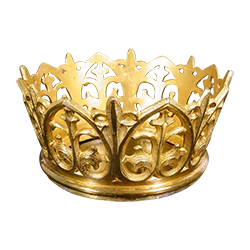 Appearance: A head accessory made from a pure gold with the shape of a crown, it is 15cm in diameter and 15cm tall. The magic circle is hidden at the inner side of the small crown. Appearance: Black and Gold Regal half fighting cape, made of a mysterious and durable material. The length of the cape is 107 centimeters and covers the users left arm, the cape remains strapped on to the users torso by golden knotted chords. The material of the cape is very thin and malleable similar to silk. Appearance: A golden and ornamental longsword about 150 cms long. The hilt of the Damokles is complex flowery and ornamental. The entirety of the blade sparkles with lovely golden particles as it does before it attacks. Appearance: They are small birds being between 2-3 inches in size. The Melodies have beautiful golden and sun kissed feathers and their beaks are small and sharped with several holes in them which form a flute.